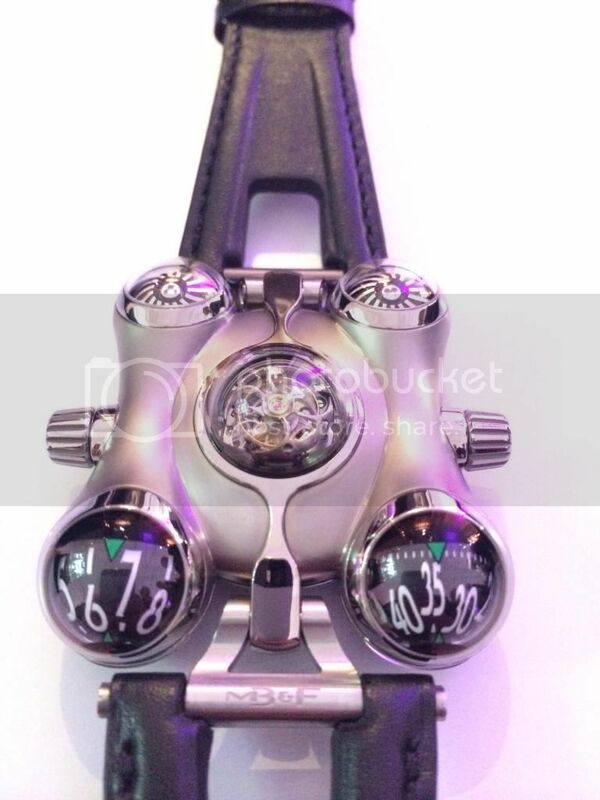 I'm sure many of you already know the MB&F HM6 Space Pirate. "In each of the four corners of HM6's biomorphic case is a 360° sphere, capped top and bottom by transparent sapphire crystal domes. Up forward, two semi-spherical indications rotate vertically, displaying hours and minutes. Back aft, driven through multiplying gearing by the automatic winding rotor, twin spherical turbines spin horizontally, automatically regulating the winding system in case of excessive speed to reduce stress and wear. The transparent central dome houses a 60-second flying tourbillon, the precision regulator of HM6's Engine. This flying tourbillon can be protected from UV radiation, which speeds up oxidation of lubricating oils, by a retractable shield operated by a crown on the left side of the case." You can see that there are two crowns. One is for the usual purpose, and the other one is for opening and closing the "retractable shield". Here's a picture of the movement. 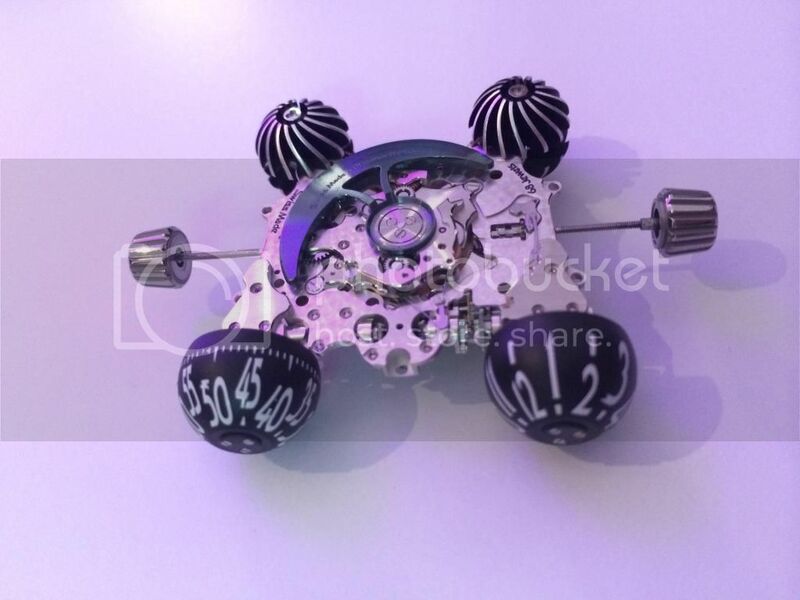 The watch pictured above is a limited edition of 50, and I'm guessing there will be other versions in the future, but the company has said that a maximum of just 100 HM6 movements will be made in total. I think this this video is good at demonstrating the turbines in action. The faster the rotor spins, the faster the turbines spin, and therefore the more wind resistance they experience. I tried to imbed the video, but I couldn't figure out how, sorry!